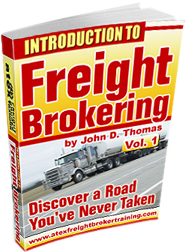 You’ve probably been wondering for months – maybe years – what IS a freight broker and how do I get started? These materials will answer your initial questions plus many, many more. It’s now time to get some answers. 10 Topics, about 40 pages. 30-Day Guarantee Through Clickbank. After reading these materials toward the end of the report, you will have the option for ordering the next level that will give you more detailed materials with step-by-step instruction on getting your business started and running. Think about it – you could be calling on customers in as little as 30 days! ClickBank is the retailer of products on this site. CLICKBANK® is a registered trademark of Click Sales Inc., a Delaware corporation located at 1444 S. Entertainment Ave., Suite 410 Boise, ID 83709, USA and used by permission. ClickBank’s role as retailer does not constitute an endorsement, approval or review of these products or any claim, statement or opinion used in promotion of this product.